Silica (Si02) is a naturally occurring compound commonly found in sand and quartz minerals. Silica is used to make glass, fiber optic cables, and concrete. Silica is one of the most common elements and is found in all types of soil. 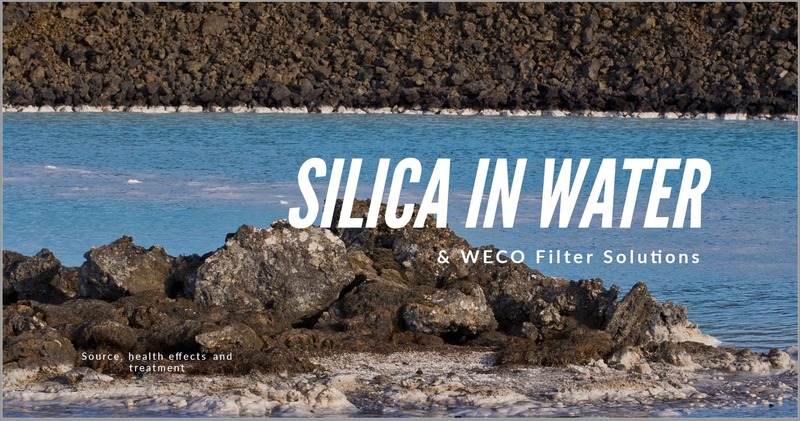 As water moves through soil and rock, silica is carried away by the water and ends up in the water supply. Health Effects of Silica: Silica is not associated with health risks at the levels found in drinking water. Silica creates a mineral film on glassware, faucets, glass shower doors, and sinks. Silica also causes scale build-up in boilers and water heaters. Concentrations above 10 mg/L of silica tend to be problematic. How to Remove Silica: Water softening followed by a reverse osmosis filtration system is one of the best filtration methods for silica removal. This combination of ion-exchange and RO filtration removes water hardness, silica, tastes and odors along with suspended particles like sand and grit, chlorine, chloramine, carcinogenic chemicals, pesticides, solvents, and heavy metals like lead, cadmium, copper and arsenic. A WECO Point Of Entry (POE) anion-exchange backwashing filter is another option for silica removal.